@foodycatAlicia great choice. 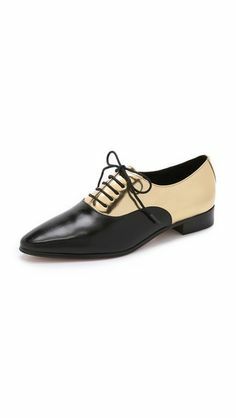 I looooooove me a cute Oxford. Those tassel loafers are super cute. I was immediately envisioning all the things I would be wearing them with, if I owned them. I will likely wake up tomorrow morning, look in my closet and be disappointed to realize I do not, in fact, own them. I bought gold brogues in Paris a few months ago and I am obsessed with them. I used to wear only heels, but I've become a sneakers and oxfords gal. My feet are happier! Those are awesome @ashtangajunkie! My head really REALLY wants to wear heels, but my knees, ankles and feet disagree. Man I wish these came in a sensible heel height! Ohhhhhhhhhhhhhhhhhhhhhhhhhhhhh me likey @foodycatAlicia! Those are really pretty! @ashtangajunkie What brand are those gold tennis shoes? I love them! @TravelingDesign They're Geox. I love them too. They have excellent sneakers right now! Those are gorgeous! I couldn't wear that heel, but with a nice low heel they'd be fantastic! See, there's a great shoe store one shop down from my post office. Since I had to mail a package and get stamps, of course I also had to look in the window of the shoe store. And I saw these and could not resist.